"A nice change after all the pink"?! What?! ;) Lookin' good my friend! You are so close on your turtle head!!!! 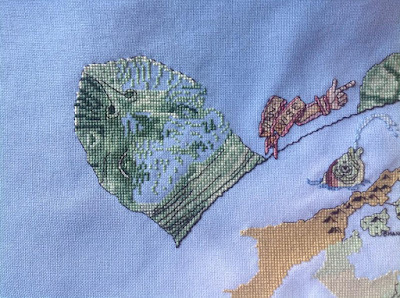 You accomplish so much wonderful stitching! It amazes me. I think I should join the group. I stitch every night for at least 2 hours. That might qualify! You got so close to your goal of finishing his head. Beautiful! Great work on your Alice piece too. Hi Jo: Great progress, I will be doing the ISHW next month, I just hate signing up on facebook, I miss the old way of signing up. The turtle looks amazing....you almost got your goal!Great progress on the Alice piece too. Oh, I am so dumb, I just realised that it is a turtle's head and the map is on his shell????? I miss the old way of signing up for IHSW too. More and more I'm growing to hate facebook and what it's become. I may jump ship entirely soon. Nearly done, the turtle‘s head. And Alice is coming along so nicely. I also love these colour changes, block stitching is not for me, lol. Alice has hands! And arms! And look at that flamingo grow - great progress, and also on the turtle head, that looks nearly done! Great progress on the turtles head, you are really whizzing along with that. OMG I just realised it was the turtles head too!!! D'oh. Now that I look at it, it's totally obvious. Sooooo much progress stunner. 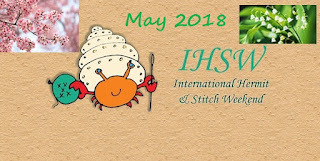 May IHSW = great success.